Cliffe started brightly and looked to dominate from the beginning with Dave Heron down the right-wing getting the better of the Plexus defence. With a few corners and Heron coming close Cliffe eventually got their reward for their pressure when Andy Addison swerved the ball into the net from all of 30 yards to take Cliffe into the lead within the first half-hour. This slender lead remained until half-time. Cliffe continued to look the better side but the Cliffe team as a whole was not excelling and Plexus looked as if they might be able to grab an equaliser. Cliffe possibly should have had a second goal when a squared ball from Nelly Lambert Ben Rawson was blazed over the bar by Andy Kirkham. 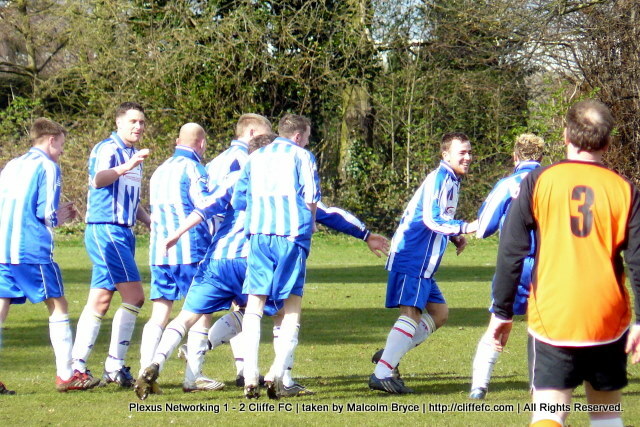 Kirkham’s miss turned out to be a turning-point as Plexus indeed did equalise and Cliffe had to step up if they were to win this game and to win the league title. Cliffe did grab a goal which would be the winning goal when a free-kick was headed by Shane Cawkill goal bound to be scuffed off the line/behind the line by the Plexus ‘keeper only for Lambert to smash the ball into the goal to make sure and to seal the win and crucial three points for Cliffe. Cliffe are still in third place level on points with Total Signs in second and Hedon Rangers are top, four points clear with Hedon playing one more game. Hedon entertain Total Signs next Saturday and Cliffe still have to travel to play Hedon away and play hosts to Total Signs. Cliffe FC are in cup competition this Tuesday away to North Newbald and return to league action on Saturday when Skirlaugh travel to Cliffe Park.